Psychiatrists say a decision to close a unit which offers unique help to people with complex mental health problems will harm vulnerable patients. 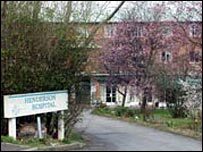 The NHS trust which ordered the closure of the Henderson Hospital in Surrey says it made the decision "with great sadness". Doctors have pinned the blame on changes made by the government to funding arrangements. The Henderson is based in Sutton but treats patients from many other areas. It does intensive work with people who have a moderate or severe personality disorder. This means they have enduring emotional and behavioural problems which can involve them harming themselves or others. Many people at the Henderson have experienced serious neglect or abuse in earlier years. A year ago, the hospital received national funding, and had a six-month waiting list. But then funding passed to local NHS trusts, and referrals dwindled. Currently, only 12 of its 29 beds are occupied. Residential care is expensive - but psychiatrists say the cost of treatment at the Henderson Hospital is recouped in the long run because, after patients leave, they tend to be far less dependent on other services. A consultant psychiatrist, Dr Diana Menzies, said: "These are people who, if not treated, tend to come back through the revolving door and on to acute wards in psychiatric hospitals. "Closure of the service will add to the impoverishment of psychological treatments. "It will be the most vulnerable in our society who pay." The South West London and St George's Mental Health NHS Trust, which made the decision to close the hospital, said it recognised the tremendous contribution that the Henderson had made over the past 60 years. In a statement, the trust's chief executive Peter Houghton said: "The trust can no longer afford to subsidise the hospital at the expense of other services. "It is with great sadness that this decision has been taken." A woman who asked to be identified only as Vicky described the difference the Henderson had made to her. Vicky, who was treated at the hospital for a year when she was 25, said: "Before I had always been isolated. "I was self-harming, and struggled to be by myself for any period of time. I was like a timebomb of self-destruction. "But there you learn to let other people help and support you - and you do the same for them. "Now I'm not involved in psychiatric services in any way. I've been completely discharged for two years. "I'm working full-time, and I manage to live on my own. Basically I now have a life." Marjorie Wallace, chief executive of the mental health charity SANE, said the closure of the hospital was a significant setback. She said other specialist units were also facing cuts. "This short-term thinking endangers specialist hospitals who have shown that, by the intensive treatment they provide, people can become far more able to live with their mental health problems and avoid relapse. "We expect that after all the closures over the years - nationally, more than half of the psychiatric beds have closed in the last 20 years - there will be more people in casualty departments, and more whose lives will be at risk."